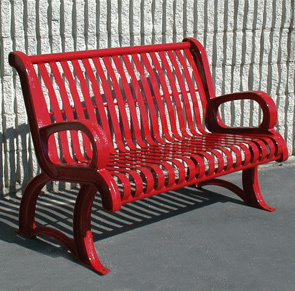 Attractive outdoor benches featuring a combination of simple and flowing lines. These extremely durable benches will enhance any park or recreation area and last for many years. Commercial grade steel with a vertical slat seat and your choice of textured or solid powder-coated color. Includes pre-drilled holes on the feet for theft deterrent surface mounting. 3/16" x 1-1/2" Flat Bar Seat Slats.